The Skinny - HEALTHeME's Official Blog: The top 4 reasons you need potassium in your diet! The top 4 reasons you need potassium in your diet! Why do bananas wear sunscreen? Because they peel! When you’re done laughing (it’s OK, you know you wanna giggle! 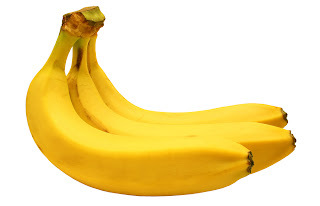 ), we’re going to get down to banana business. The CDC recognizes our yummy, yellow, self-packaged friends as the fruit of the month. And, since bananas are great sources of potassium, we thought we would take the opportunity to point out the importance of getting plenty of potassium in your diet. It helps you flex your muscles. Potassium is required to help your muscles contract properly, including that all important muscle - your heart. It's an important part of your metabolism and helps your body utilize carbohydrates. Some studies have indicated that getting plenty of potassium in the diet may help you maintain a healthy blood pressure. Potassium is reported to help maintain bone health and may prevent osteoporosis. The recommended daily intake of potassium is 4700mg per day, which is about twice what the average adult consumes each day. You can get enough potassium by eating a diet high in fruits and vegetables. Besides bananas, some great sources of potassium include Swiss chard, lentils, kidney beans, potatoes, dates, tomatoes, and yogurt.